Are the new readers gone yet? So, about a year ago, a few things happened. We bought a house. We moved to the suburbs. I started working on a new movie. Our kid turned two. And this blog ceased to exist. I’ll spare you the details, mainly because I don’t understand them, but it had something to do with a bad database, or gnomes, or sunspots. Maybe all of the above. They say that being a parent really changes your priorities. What that means in practice is, you have an incredible excuse to be lazy about anything not directly related to your kids. Awesome! So the blog remained dead. Then, last week, things got a little worse: the machine with the dead database crashed altogether, taking all of my web sites with it. Basically, the Internet forgot I existed. This was a little too much to take. So, I dug up my poorly maintained backups, found a new web host, and set to work making things right. A lot of interesting things have happened in the past year, things I would have blogged about if I could have. So you might start seeing backdated posts popping up here and there. Be nice and pretend I really posted them on the “published” date, would you? Well that was fun! A bunch of us won an award from the Visual Effects Society for our work on the character of Toothless, from How to Train Your Dragon. Go Toothless! We received our first official film festival rejection letter this morning via email. It was kind and gracious and encouraging, and beautifully written. I was so touched by the letter, in fact, that I wrote back with a quick note thanking them for the courtesy of letting us know. * I wasn’t expecting a response, it just felt like the right thing to do. Minutes later, I got an answer back from the festival director. They had sent me the wrong letter by mistake. Our film was accepted after all! That festival was the Nevada City Film Festival, where How to Make a Baby will play in late August. Over the next two months it’ll also screen in Rio de Janeiro, São Paulo, and New York City. It looks like the festival organizers have put together some amazing programs, so if you live near any of those cities, I highly recommend checking them out in person. 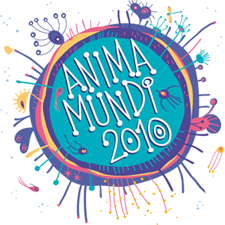 You can click the images above for the dates and details, and as always, see our festivals page for the whole list of events. *Many festivals don’t bother to inform filmmakers that their films have been rejected: you have to wait ’til they release the list of accepted films, and then search for your film in the list, a rather heartbreaking process if you were hoping to get in and didn’t! Vote for us in the DFF Audience Choice Award! If you can see the embedded video above, just click the little heart to let them know you “like” the film. Also, one voter selected at random will win something called a “DFF Survival Kit”. (Personally, I didn’t find DFF particularly hard to survive, but I’m sure it’s a very cool kit, whatever it is!) Voting closes May 31st. 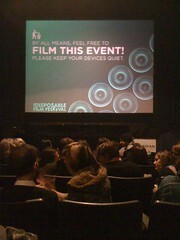 The Disposable Film Fest opening night was a fantastic show. From the very start you could tell that the curators had great taste. Every film had something unique about it: an inspiring use of cheap technology, a fresh visual idea, or just a really funny story. I found myself grinning and bouncing through most of the show. And it was wonderful to see our short film with a live audience, because it got an amazing reaction. (When even the title card got a laugh, I could tell that the crowd was ready to have some fun!) And the organizers couldn’t have been nicer people, with a fun, lighthearted approach to things that was reflected in every aspect of the event (like the message projected above before the show began). Here’s a small collection of some of my favorite films from the opening night event. The festival is continuing throughout this weekend, with more short films and even features. I highly recommend checking it out! See us on the big screen, if you’re so disposed. 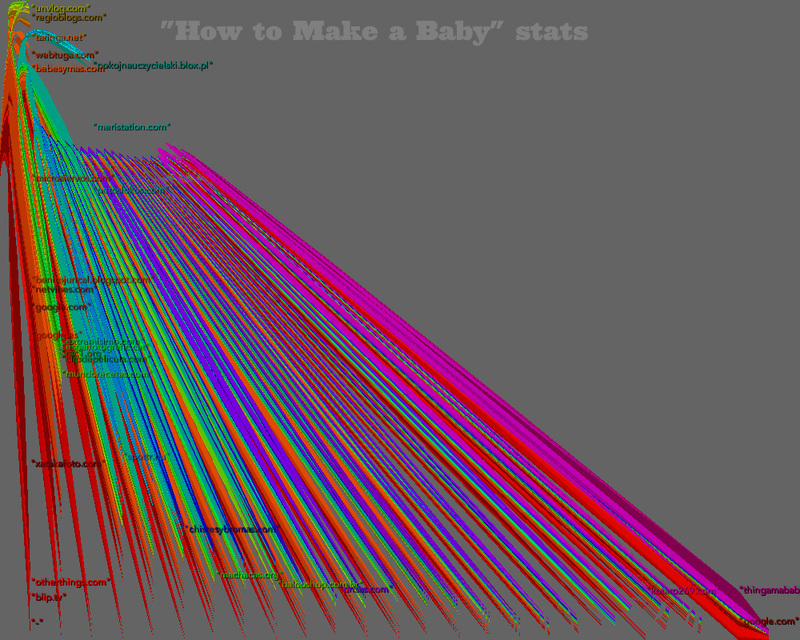 Good news: our short film, How to Make a Baby, is heading for the silver screen! It will be in the competitive shorts program at the wonderfully named Disposable Film Festival. The big event is Thursday, March 4th at 8pm at San Francisco’s Roxie Theater. Sure, you’ve seen it on the internet. But the Roxie’s screen is, like, a million feet wide! How big is your screen? You can buy tickets in advance if you like, and there’s a party next door after the screening. Come hang out with us and all the other disposables! Hola everybody… I’ve finally upgraded to the latest version of WordPress, so I can do things like post from my phone. You’re also gonna see some backdated posts coming in soon, about some other important upgrades in my life. :-) No, you didn’t miss them the first time– I’ve just been too busy to post!